In the middle of the Mediterranean Sea, the small island nation of Malta has been attracting tourists and property investors for years now. 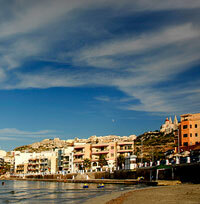 Sunny beaches with crystal-clear waters and fine sands make Malta a year-round holiday destination. Medieval knightly castles and mysterious Neolithic temples add to its allure. And a relatively high GDP per capita, a robust property market, good infrastructure, a stable political system and a low unemployment rate also contribute to its appeal as a Mediterranean vacation choice, a summer home location, an island to retire to, and a place to invest in. Malta consists of three inhabited islands (Malta, Gozo, and Comino) and a number of smaller uninhabited islands just south of Sicily. In 1530 the islands were granted to the Order of the Knights of St. John by Charles V, ruler of the Holy Roman Empire. He was also king of Sicily, to which Malta had belonged for four centuries. The Grand Master of the Order became the head of state, and Malta was ruled by Grand Masters until the end of the 18th century, when Napoleon captured it. The 1814 Treaty of Paris that ended the war between France and the Sixth Coalition then placed it under British rule. 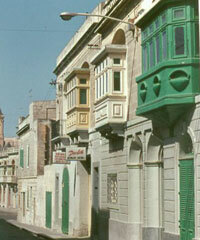 The Grand Master’s Palace in the capital, Valletta, became the official residence of the British Governor. Malta’s position in the centre of the Mediterranean made it an important base of military operations from the time of the Crusades and the Holy Roman Empire all the way up to World War II. Malta was an extremely important air and naval base for the Allies during World War II, and was intensively bombed for it. Malta gained its independence from Britain in 1964. Today, Maltese culture is a blend of the many cultures that have made their way to the islands over the centuries, including those of Sicily and Britain. Malta has been settled since Neolithic times. The islands’ first inhabitants constructed the Ġgantija megaliths, some of the oldest man-made freestanding structures in the world. The complex is also believed to be one of the oldest religious sites in the world, as many think that the temples belonged to a fertility cult. The ruins of other temples and megaliths can be found throughout the islands, their intricate bas relief carvings silent remains of the cultures that created them. Roman ruins can also be found in Malta, in classic country villas and catacombs. Compared to these ancient remains, the Baroque and Renaissance architecture of churches and homes built in the 15th century onwards are recent developments. Malta holds on to strong traditions. Most buildings are still built out of limestone dug from local quarries, and houses are recognized by names rather than street addresses. Nearly all communities are centred around the neighbourhood parish church. At the church piazzas, or public squares, you will commonly find the locals congregating socially, especially on Sundays. The population is largely homogenous, mostly native Maltese but with a significant British minority, mainly made up of those who have chosen to retire in Malta. 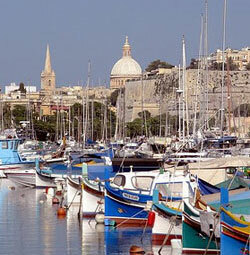 Malta has long been attractive to vacationers and retirees. The British have been particularly drawn to it, and the reason for the former colony’s appeal is obvious—it is a sunny, Mediterranean nation with an English-speaking population. Large-scale construction and renovation projects are going on in prime areas such as the Valletta Waterfront and Tigné Point. Education is free, subsidized by the government and based upon the British model. And thanks to British rule over the islands until 1964, the Maltese speak English; it is one of the country’s two official languages. Maltese, which is descended from an Arabic dialect and which has incorporated many Italian and Sicilian words in its vocabulary, is the other. Malta is a safe country. There is no political instability, and the crime rate is low. Violent crime is rare. The climate is pleasantly Mediterranean, with mild, rainy winters and hot, dry summers. Its coastline is marked by dramatic cliffs, craggy coves, and scenic bays. There are some lovely beaches, unremarkable by international standards but pleasant enough for a day’s swim and stroll.